So I am admitting that this past week I did not plan out my meals the way I had hoped 😦 I usually base my cooking schedule on my boyfriend’s work schedule and this week was a little weird so I just went with it on a day-to-day basis. I repeated some old recipes I had used already but hadn’t made in a while. Something simple and quick is what I was looking for. A few months ago I tried out this new quinoa recipe. Quinoa is an amazing source of protein and I use it as a replacement for rice whenever I can. This particular recipe was simple and it goes so well with any meat you want and a simple salad. 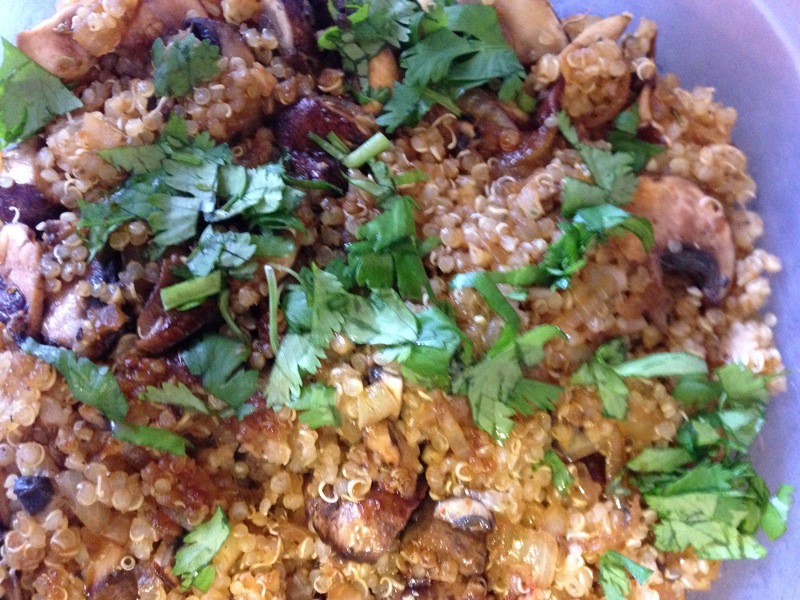 Its a Garlic-Mushroom Quinoa. I make it with some grilled chicken and a very simple salad of tomatoes, cucumbers, red onions with olive oil, some lime juice, salt and pepper. Tastes amazing. You start by cooking the quinoa according to the box instructions. Once its done take it off the stove and let it cool down a little. While its cooling, take out a pan and pour in some olive oil, just enough to coat the pan lightly. Once the olive oil is hot add some diced yellow onions. Let the onions cook for a bit, when about three minutes have passed add the minced garlic, I always use three cloves. Let that cook for about two minutes and the add the sliced mushrooms, I use about 7 of them. The original recipe calls for cremini mushrooms, but I have used baby portobello mushrooms and it tastes great. Sprinkle in some salt, pepper, red pepper flakes if you wish and cook until the mushrooms are soft. Once that happens, add the quinoa. Add just enough. 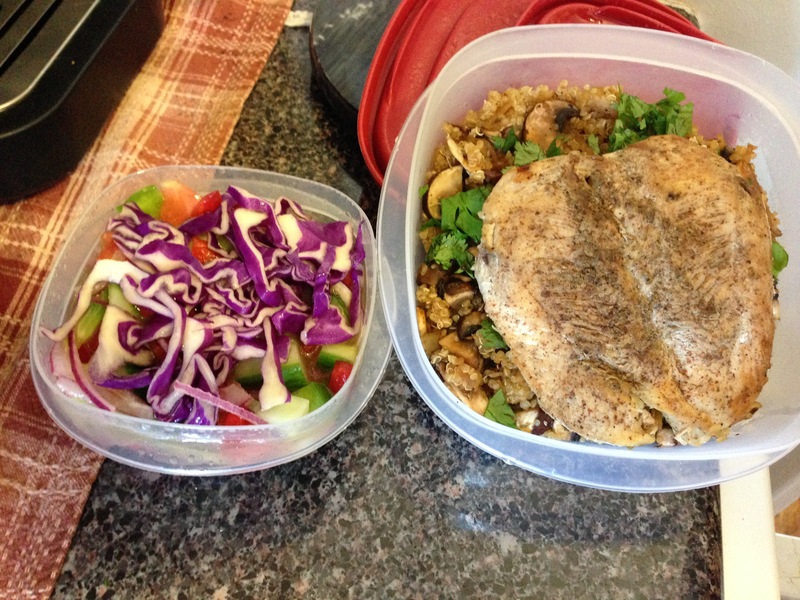 Don’t overdo it because you’ll end up with a whole lot of quinoa and little bit of mushrooms. I have done variations on this dish, I have added Worcestershire sauce to the mushrooms while they are cooking. I have added soy sauce. Make it your own. Once you turn off the heat add some chopped parsley or cilantro and you’re good to go 🙂 This is my go-to recipe because its so simple and so quick to make and you can always dress it up differently.